F YOU have attended an event recently - perhaps a friend's wedding or your company Christmas party - you may have been fortunate enough to meet a silhouettist. If so, you probably came away with a small cut-paper portrait and thought it all a lot of fun. While placing it onto the mantelpiece you may like to reflect that your new silhouette is part of a living tradition stretching back to Georgian times. The first silhouettists were portrait miniaturists seeking to broaden the appeal of their art by creating a quicker (and less expensive) kind of miniature. Calling their new portraits ‘shades’ they started a craze for cheap, on-the-spot profiles which went viral throughout eighteenth-century Europe and the New World. People discovered a passion for small, inexpensive likenesses of family and friends which could be passed around as personal mementos. The craze lasted for over 100 years, until the invention of the camera which did the same job far better. Cutting a silhouette requires the same careful hand-eye coordination that an artist needs to draw from life, but without the luxury of time. 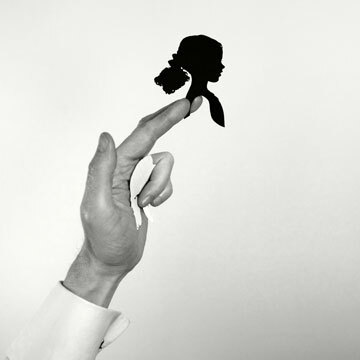 The silhouettist does not stop to plan his work, but cuts straight into the paper with barely a glance at his subject, producing an instant portrait with a pair of scissors and a certain amount of luck. This traditional technique is known as cut and hope! Right: A freshly-cut silhouette raised high for all to see. Holding a finished silhouette up to the light lends it a curiously ephemeral quality, like holding a miniature shadow between your fingers. The silhouette will later be mounted onto card for safe keeping. Silhouette artists Michael Herbert and Charles Burns have been working together as "The Roving Artist" for over ten years, brought together by a shared interest in the little-known art of silhouette cutting. They have taken what is often perceived to be a lost art and re-invented it for the 21st century, combining traditional skill with modern and stylish presentation. Today they work at a wide range of events all over the country; it is not unusual for Michael to find himself at a wedding in Italy while Charles is working at a product launch in Birmingham. They also run workshops and give talks, while Charles has written a book on the subject: Mastering Silhouettes, published in 2012. 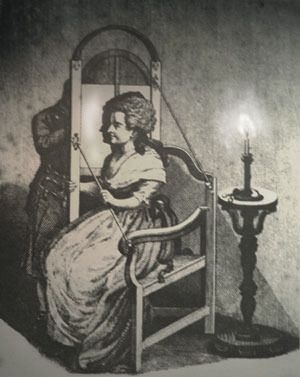 A Georgian-era silhouettist in action using a shadowgraph screen to trace a shadow by the light of a single candle, a process that was usually completed in a minute or less. Eighteenth- and early-nineteenth-century artists relied on a wide and eccentric range of contraptions to take and reduce a shadow when making their silhouettes. Today's artists just use their scissors and a keen eye. People frequently - but erroneously - assume silhouette cutting to be a Victorian art. The Victorians were actually very dismissive of silhouettes, considering them unbearably old-fashioned and completely outmoded by the then-new technology of photography. All text and images (including background images and navigation buttons) are copyright protected. Do not reproduce without express permission.